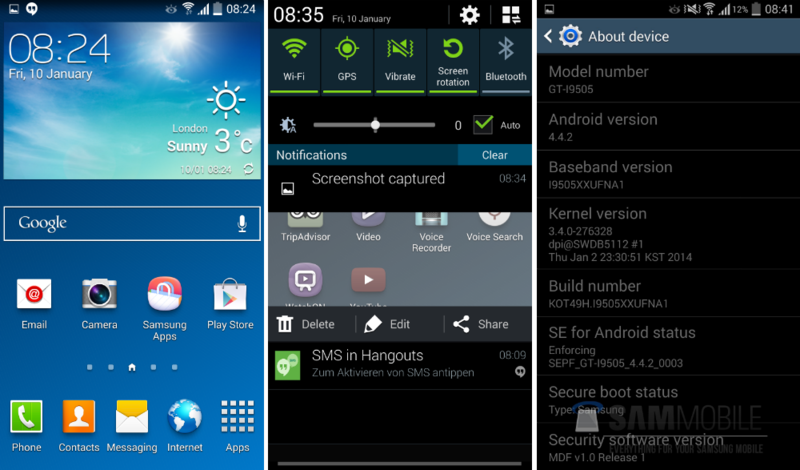 A leaked test build of Android 4.4.2 has recently leaked for the Galaxy S4 from Samsung. With the company remaining quiet as to when users of the device can expect to officially see the update roll out to their devices, seeing this build leak is a really good sign. Since it’s in testing, and now leaked, U.S. GS4 owners could see it within the next couple of months we would expect. As with all things in this industry, nothing is confirmed. While the Android build is Kit Kat, Samsung still has TouchWiz all over the place. On a good note, it appears that they have officially moved away from the green battery icon and multi-colored notification icons, though. As we can see in the screenshots, we have the standard white Kit Kat icons, which should make a few of the Android elitists among us quite pleased. For an even deeper look at the “new” TouchWiz running on the Galaxy NotePro and TabPro tablets from Samsung, check out our hands-on at CES right here. With that version of TouchWiz, Samsung implemented a lighter-looking UI in the notification pulldown and Settings menu. Users of the test build state that besides slight performance increases and the white icons, it’s pretty much the same device with few changes. If you own one of the GT-I9505 Galaxy S4 models, and want to try Android 4.4.2 for yourself, SamMobile has posted a link to the zip file for flashing, as well as instructions. Galaxy S4 owners, we know you are getting impatient for Kit Kat. Don’t worry, it’s coming.